This weekend, spend time with your family celebrating the holidays at Casino Pier’s Holiday Festival in Seaside Heights, Fair in the Square in Verona, Lake Mohawk German’s Christmas Market in Sparta, having Brunch with Santa at Laurita Winery in New Egypt, gift shopping at Project: Market 2017 in Jersey City and Weihnachtsmarkt at the Asbury Festhalle & Biergarten in Asbury Park, plus many more kid-friendly fairs and festivals in New Jersey this weekend. Tuckerton Seaport’s Annual Christkindlmarkt is a three day family fun event celebrating the traditions of the season with a Holiday Market and Craft Fair under a huge heated tent all along Seaport. The variety of activities include: holiday horse drawn wagon ride, Mary May’s Master Decoration Christmas Ornament Class (classes begin at 10am, 11am, 2pm, and 3pm with a fee of $15 for members and $20 for nonmembers plus $7 for materials), the craft fair, food trucks, live entertainment, gourmet vendors, and plenty of craft drinking options for adults. The 36th Annual Old Time Christmas walk in Bay Head is the ultimate Open House and exploration adventure around the town for all families. This event will have all the top local businesses displaying a variety of goods to indulge in, beautiful scenery on your stroll from Bridge to Lake to Mount and Main, musical programs hosted by the local schools, Hot cocoa and Hot dogs provided by the Boy Scouts, meeting Santa at the local firehouse, and the local tree lighting ceremony. The event also includes caroling and refreshments at All Saints Church, the Nutcracker Ballet program at Bay Head Violin, airing of Charlie Brown’s Christmas on Main Ave, and singing of ballets from the movie “Frozen” at the Fire House. Bay Head will be the place to be for all things holiday cheer and more, so bring the family out for an exquisite weekend. Pyanoe Plaza will be the place to be in Belmar for the ceremonial Tree Lighting. The holidays are here and this will be the start of all the Christmas fun. All families attending can partake in the Tree lighting, assortment of candy canes available to all, a merry visit from Santa, and much more. The Ocean City Christmas Parade has finally arrived, and your family can only experience this wonderful merry event at 6:00pm on Asbury Avenue from 6th to 11th Streets. Make sure your family does not miss out on Registration, and join so many other families in the Ocean City area for the start of the best time of year. Your family can partake in the longest-standing holiday-themed 5K race series around, and at the same time your family will be joining the fight to conquer arthritis. The Arthritis Foundation’s original Jingle Bell Run is a fun way to get decked out and be festive, while racing to raise funds and awareness to cure America’s #1 cause of disability. Your family is encouraged to dress up in the best holiday garb, tie jingle bells to your shoelaces, and reign in the holiday cheer with plenty of other families. ’Tis the season to live it up and be jolly for a reason, Bring a team of friends, family and co-workers to run or walk, spread smiles and good cheer. 100 percent of your registration fee and fundraising efforts go to this great cause. The annual holiday event at Brookdale Park in Montclair, NJ is a new fun way to look at the best time of year. Run Santa Run is a joyous run/walk led by good old St. Nicholas himself. Bring your whole family or friends out to partake in the free Santa hats, holiday music, hot cocoa, prizes and vendors. Children can meet and take pictures with Santa, and families attending are asked to bring a canned good or lightly used clothing for families in need this holiday season. Lovers of the Winter Solstice can come together to celebrate the holiday season at Cattus Island County Park’s 5th annual Winter Solstice Celebration. The bewly renovated Cooper Environmental Center will host free activities including: Horse & carriage rides, live raptor presentation, candy canes, nature walks, campfire, Fresh Pine Swags making, gift auctions, crafts for kids, face painting, an array of vendors with seasonal items, food, and a special visit from Santa. The City of Jersey City + THE JERSEY CITY PROJECT will celebrate its fifth Project: MARKET on December 2nd and 3rd, 2017. The heated outdoor market located in the Historic Downtown section of Jersey City, NJ will act as a kick-off to the holiday shopping season highlighting local, celebrating seasonal, and encouraging economic growth throughout the community. It features a lineup of 60+ local merchants offering food, home goods, clothes, jewelry, and more. Food trucks will be on site, as well as heated seating areas and live music in the evenings. And card making/special picture making for our Service Members. There will be an indoor snowball fight, a visit from Santa, and a lot more fun that has yet to announced. Join St. Clement Parish’s Altar Rosary at their Annual Christmas Craft show on Saturday, December 2. There will be super and regular raffles, 50/50 baked goods, poinsettias, and free raffles for kids. The Lake Mohawk German Christmas Market in Sparta continues to be ranked as “One of the Top Ten Things to Do in December across the entire State”. This is a traditional MUST-DO for festive shoppers. This magical Christmas Market has an assortment of crafted and unique gifts from over 100 vendors that are from all over. The perfect backdrop of Lake Mohawk ensures your shopping experience will be more than just shopping around, brought brings out the pure essence of the holidays. This charitable atmosphere attracts over 20,000 to Lake Mohawk over the weekend, and will also host activities such as: petting zoos, pony rides, and a holly jolly visit from St. Nicholas. There will also be an Entertainment Tent featuring local musicians and dancer, as well as a Tent from Freehand Custom Carvings and NJ International Gallery of Wood Sculpture, who will be presenting live carvings. Your family simply cannot miss the magical start of the Holiday Season. Come to shop, dine and be entertained. 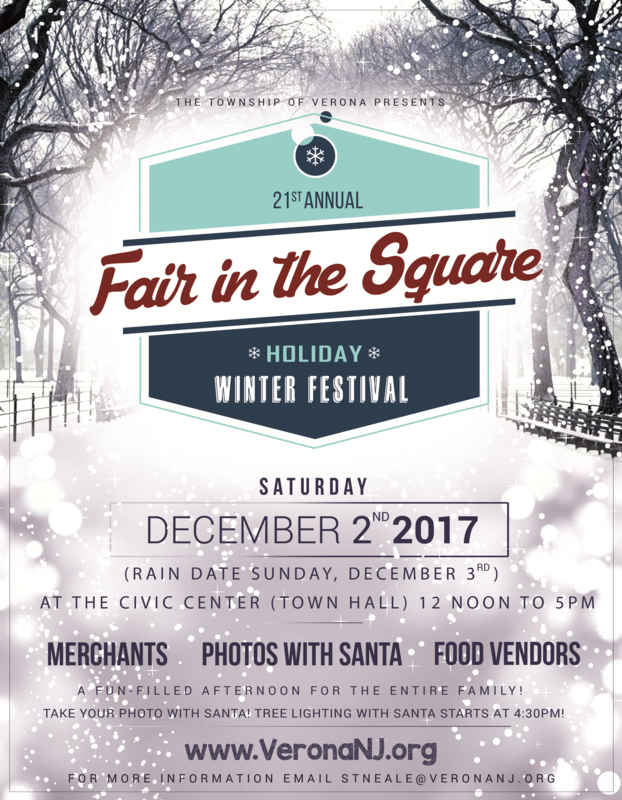 The 21st annual festival for Verona and its surrounding communities invites all families who love holiday season to partake in a variety of crafters, vendors, entertainment, and children’s activities. Food and beverages will be sold on the premises, and there will be a special greeting from Santa as well as a traditional tree lighting. All families are encouraged to join in all the holiday merriment so do not miss out. The 40th Annual Hope Christmas Craft Market will be a huge gathering of over 200 artisans in collaboration and participation to put on display the best holiday items. This town wide event will have a shuttle bus to help your family travel through navigate all of the great displays throughout the town. This will be an all day event, so bring the whole family, and remember that there is no place like Hope for the Holidays. The Craft Show at Frelinghuysen Arboretum will be sure to put your family in the holiday spirit. This event will not be short of gingerbread treats to play with and to eat. Make sure your family does not miss out on the chance to get creative during the holiday season. Asbury Festhalle & Biergarten’s Weihnachtsmarkt is a Rooftop Europmean Holiday Market featuring over 25 vendors and live music. There will be artisanal gifts, speciality foods, handcrafter toys, and pictures with Santa from 2pm to 5pm. Your family is encouraged to come wander through the first floor of Ringwood Manor, and celebrate the 42nd Annual Victorian Christmas at the Manor. This beautifully decorated venue features a self-guided format allowing visitors to spend as much or as little time in each room as they wish. There will be Brochures and interpretive signs, along with our knowledgeable volunteers that will provide those interested in the history of the site with plenty of information. The gorgeous furnishings will inspire your family to create their Victorian Christmas decorations, and each room will help you instill a sense of Gilded-Age elegance to your own home. Children will be given scavenger hunts and can search for a variety of interesting objects throughout the house. Crafters will have hand-made items for sale to help you buy that perfect holiday gift for your loved ones. The quaint Victorian Coffee shop next to the Manor will be open during the event and visitors will be able to purchase light refreshments. The Fall Early Childhood Programming encourage family learning and foster early environmental awareness. All families and their young children will discover the natural world through play, art, stories, and more. This program also is designed for toddlers and adults to discover the natural world together. The alphabet will be the vehicle used to explore different animals in the zoo. Each day your children will discover a different animal type such as mammals, birds, reptiles, and insects. Stories, projects, and special animal visitors in the classroom enhance your class experience. Each child must be accompanied by only one adult who is willing to take part in the activities. For everyone’s safety and enjoyment, unregistered children (including siblings) may not attend. SESSIONS: Each session features classes with a different theme, so you can attend one or all three. Please note, each class offered within the same session covers the same content. Laurita Winery is adding to their list of great family friendly events with a Sunday Brunch with Santa himself. This event will treat all children attending to a pair of the most beloved holiday traditions, and enjoy some quality time with Santa Claus. Attending this event might event get you placed on the nice list this year, so do not miss out.